Congrats Maria + Harry! We wish you so many years of Love, Happiness, and Adventure! Harry and I met at the University of Notre Dame the day before the first day of class freshman year. After two years of close friendship, we began dating during our junior year...and the rest is history! Throughout our years together, we've made it through many trials and tribulations - Maria studying abroad, Harry graduating Notre Dame early, a year of long distance with Harry in Montreal and Maria in Chicago, and a cross-country move to Seattle. However, when Harry proposed on December 8th, 2016 the answer was an easy one! We chose to get married in Louisville, KY, Maria's hometown. Because of Harry's job as a professional soccer player, we literally had THREE days all year that we could get married. We chose December 16th, and crossed our fingers for good weather. 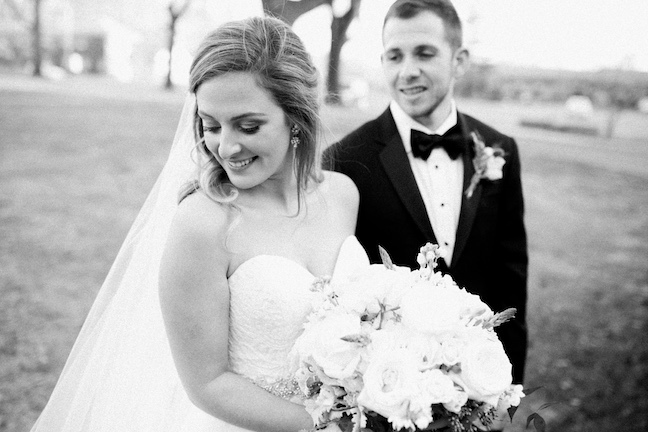 It ended up being an absolutely beautiful day - our December wedding was 55 degrees and sunny! We were so happy that we were able to take photos outside and not freeze to death! It was very important to us to have a wedding that included all of our family and friends, and we were blown away by the number of people who made the effort to travel from near and far so close the holidays to celebrate with us. The wedding ceremony at St. Agnes Catholic Church was beautiful, and our priest gave a wonderful homily in which he read letters that we had written to each other. It was very special and meaningful. Our reception venue was gorgeous - The Gramercy's beautiful chandeliers combined with our winter white flowers, greenery, & subtle navy and gold accents created a warm and elegant atmosphere. The food from Wiltshire Pantry was delicious, and the dance party after our dinner and speeches lasted into the late into the night. It was a day that we will never forget! !